Near Death Experiences (NDEs) are a fascinating topic. They affect people regardless of cultural background or religious belief, or lack of it, and they’ve been recorded from the earliest days of civilisation. For years science has suggested explanations for the tunnel, the white light, the dead relatives waiting to greet you, and all the other familiar markers of an NDE. But whether dumps of DMT from the pineal gland, primitive brainstem programs or toxic overstimulation of cortical neurons, those theories have all been found wanting as we have discovered more about what really happens to the brain under the threat of death. Except here it did. Eben Alexander is a leading neurosurgeon with a well-documented career of writing and teaching about neuroscience in leading institutions. He was also a confirmed materialist and a skeptic of anything spiritual – even of the notion that consciousness existed beyond a mechanical construct of the brain’s processing of experience and memory. And then Alexander was struck down by a rare and seemingly incurable form of bacterial meningitis that threw him into a coma. The doctors at the hospital where he worked gave him less than a ten per cent chance of survival, and even if he did pull through he was expected to be irretrievably brain-damaged. Finally they advised his family to turn off life support. Yet against all the odds, Alexander did wake up, and with all his faculties intact. And he came back with a staggering account of an NDE that is all the more powerful because it could not…should not…be. His detailed medical records show that there was no activity in his brain that could possibly have accounted for what he experienced – in effect, the human, thinking part of him was dead. The unique case study alone is worth the four stars – it’s an important account in the study of NDEs. The book itself, for me, probably deserves three. It’s easy reading – no doubt because Alexander wanted to convey his experiences to the widest possible audience – but I would have preferred some more analytical writing and less visceral or emotional. 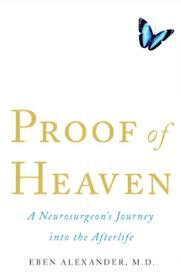 Having said that, Proof of Heaven is worth reading because of the confluence of Alexander’s scientific background and the life-changing experience he underwent, one which kicked away all the props of the intellectual life he’d built over his years in science. I have recently read this book and agree with your comments. As Alexander isnt a professional writer (i assume?) the book is lacking in a few areas. however I do think this is a must read for anyone and everyone. It comes from a fantastic source, and is a great tell of an NDE. You’re right – the material shines through despite the style. How often do we get to see an NDE told from the first person in such detail? Well worth anyone interested in this field checking it out.